Opening Friday, May 16, 2014, 8 to 11 p.m. Artist's talk Friday, May 16, 2014, 8 p.m. 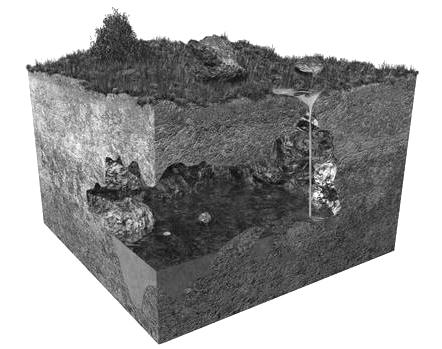 The artist will employ multiple media in the exhibition, transforming the gallery into a temporary sinkhole museum complete with diagrams, wall texts, dioramas, videos and sculptural elements gathered in an exploration of both naturally occurring and man-made chasms. "These terrestrial features, while intimating an incremental, geological time, may also be sudden, cataclysmic events. 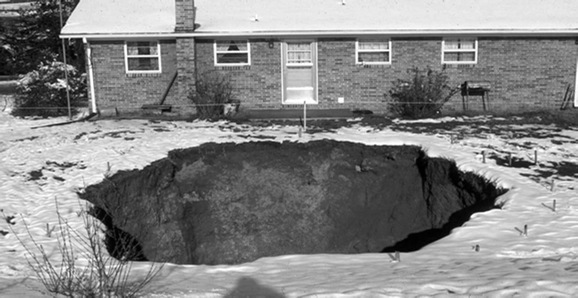 On one hand plainly topographical, sinkholes approximate a kind of dream logic wherein at any moment one might drop into an alter-territory, as implicitly trusted surfaces give way," writes Stratman. "They are, precisely, events which 'take place.' They are, if we think in terms of cinema, like an edit in the landscape. 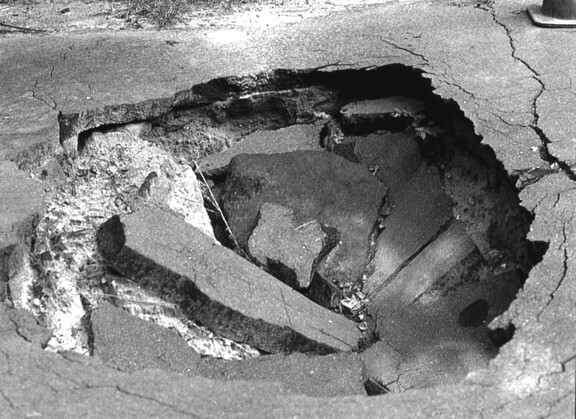 In the exhibit, the metaphysical terror of an open hole whose bottom we can't fathom will coexist alongside a methodical cataloging of landforms." A Chicago-based artist and filmmaker, Deborah Stratman is interested in landscapes and systems, and has previously worked in sculpture, photography, drawing, and audio in her pursuits and has exhibited widely at such venues as the Whitney Biennial, MoMA NY, the Pompidou, Hammer Museum, Witte de With, and Walker Art Center. Her critically acclaimed films have been featured at national and international festivals including Sundance, the Viennale, Full Frame, Ann Arbor, Oberhausen, Rotterdam, and the Robert Flaherty International Film Seminar. She is the recipient of Fulbright and Guggenheim fellowships, a 2012 Creative Capital award, and most recently the prestigious Herb Alpert Award in the Arts, 2014. In addition to major project support for HARP from the National Endowment for the Arts, Deborah Stratman's presentation at Hallwalls was supported in part with a statewide Presentation Funds regrant from the Arts Council of the Southern Finger Lakes, with funds provided by the Electronic Media & Film (EMF) Program of NYSCA. SWALLOWS: Subsurface Voids is also partially supported by a grant to the artist from the Illinois Arts Council Agency.